If you love cake pops, then this quick 30 minute recipe is for you! 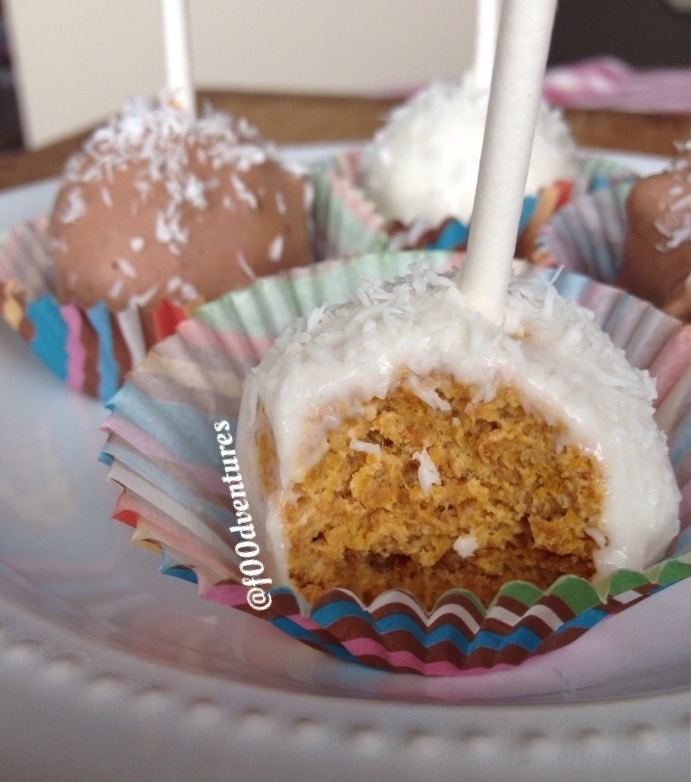 these cake pops are made with healthy, wholesome ingredients and are made with protein powder and greek yogurt for an extra boost of protein! Plus, each cake pop is only 59 calories! On a plate and microwave 2-3 min until fully cooked all the way through. Let cool on a plate while you prepare your protein frosting. Get out two small bowls, one for the vanilla coating and one for the chocolate. Mix ingredients, adding just enough milk until mixture is smooth and creamy. Coating should not be thick otherwise it will be difficult to cover the cake pops with. Spoon desired coatings on top of cake pops then Top with desired toppings (I used unsweetened organic coconut shreds) then set back in freezer to allow coatings to "set". Store leftovers in a freezer safe container.